For kids | Minato Mirai 21 District Heating and Cooling Co., Ltd.
Hello everyone. This is a place for you to learn about Minato Mirai 21 District Heating and Cooling Co., Ltd., and all about district heating and cooling. Here, you can learn about protecting the natural environment of the countryside and seaside, and other places where everyone likes to play. In those days, Japan lagged far behind other countries in science, and when the port of Yokohama was opened, new knowledge in science started coming in from overseas. 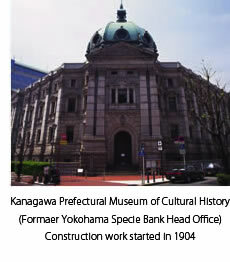 This new knowledge was like a doorway to the future that opened right here in Yokohama. It’s precisely because Yokohama is a city ahead of its time that a city called Minato Mirai 21 was planned for a future age. 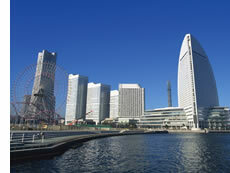 Some of you who have visited here may know about Minato Mirai 21. There are big buildings like Yokohama Landmark Tower and Queen’s Square YOKOHAMA — with restaurants, shops, concert halls and even hotels. There are also buildings where people like your father or mother work, and tall apartment buildings where your friends may live, theaters, museums and so on. There are buildings for every aspect of people’s lives. We provide cooling and heating for all the buildings in this city with a centralized system. In other words, in summer we keep all the buildings in the district cool, and in winter we keep them warm. That’s what we do at the Minato Mirai 21 District Heating and Cooling Company, just as our company name says. In our plants, we have big air conditioners and heaters which we use to heat and cool the whole district. This is what “district heating and cooling” means. District heating and cooling is a system for heating and cooling all the buildings gathered together in one place, using big heating and cooling machines to send the hot or cold energy through underground tunnels to each building. There are lots of good reasons for each building not to provide its own heating and cooling. For example, since each building is very big, the machines used for heating or cooling a single building also have to be very big. The building also has to have other equipment on the roof of the building, and they have to have chimneys. But with district heating and cooling, the energy needed for heating and cooling is sent through tunnels, so each building no longer needs its own big machine. So there are no chimneys and the space on the roof can be used for other things, like gardens and parks. Energy is valuable and the hot or cold air used for district heating and cooling is all made in one place so the energy needed to make it can be used without wasting any. And there’s no dirty air containing nitrogen oxide and sulfur oxide from chimneys, so district heating and cooling is better for the earth. You’ve probably heard about global warming. The carbon dioxide created by many of the things people do is making the earth warmer, and this is a big problem. But district heating and cooling doesn’t make much carbon dioxide, so it helps to prevent global warming. In science class, you may have learnt about photosynthesis already. Using photosynthesis, green plants change carbon dioxide into oxygen. In reducing carbon dioxide, the work that Minato Mirai 21 Heating and Cooling does has the same effect as a forest 570 times the size of a major arena like Yokohama Stadium, or approx. 3,700 acres.